One of the most helpful ways to grow as a Christian is to read good books that will inform, challenge and motivate you as seek to live your life to the glory of God. To help encourage us to read, the church runs a bookshop, overseen by Charles and Caroline Wallis, which is located in the concourse area. The bookshop sells a range of Christian books to suit all interests and ages. They cover a wide variety of issues including the character of God, the church, how to read the Bible, evangelism, Christian living, relationships and parenting. 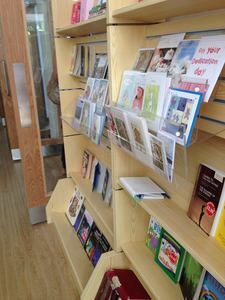 In addition, the bookstall stocks devotional books and some Bible study booklets that will help you grow as a Christian day by day, as well as a selection of cards for different occasions. If you would like some help with choosing books, please email Mark. A Women's Book Club began in September 2014. A small group meet to read and reflect on a book together and encourage each other to respond. For more details, please email Liz Turton.